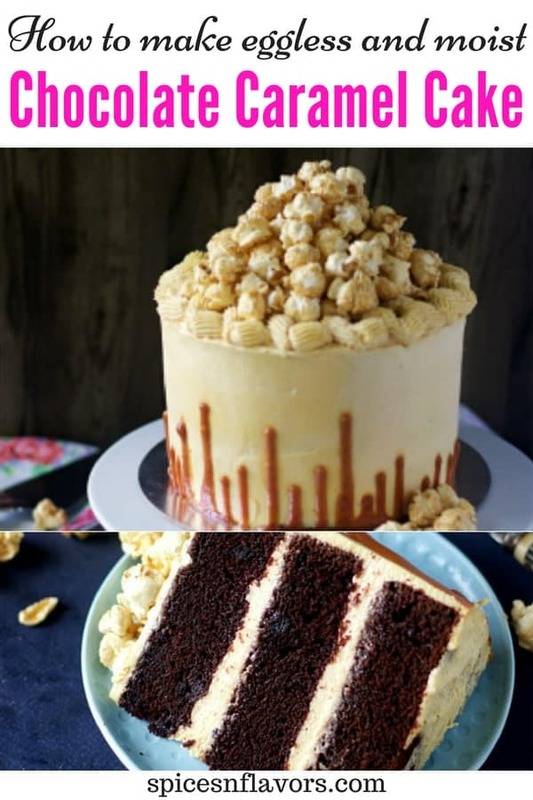 Chocolate Caramel Cake – Layers of moist eggless chocolate cake with salted caramel frosting and homemade caramel topping served with some caramel popcorn on the side. 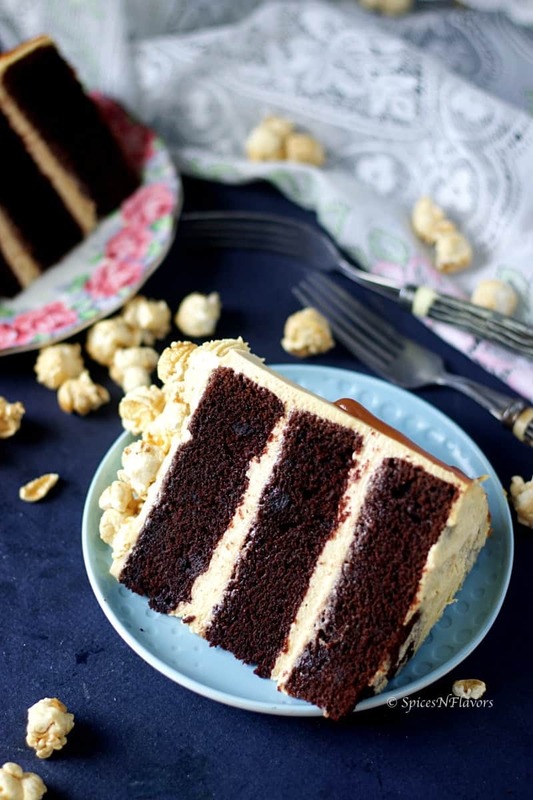 This caramel cake is a chocolate caramel desserts heaven!!! And just to let you know No candy thermometer required! Chocolate Caramel Cake is a dream cake!! A cake that I have actually made to celebrate a small dream coming true. A small milestone that I have reached. Did you know I started SpicesNFlavors Youtube Channel in July 2017 which means we completed a year of creating, editing and uploading videos on this small space and this Caramel Cake Recipe would be my 100th video which means today when I would be hitting that “Publish Button” on Youtube I would be uploading 100th video. That’s crazy!!! Coming back to the easy Chocolate Caramel Cake recipe or caramel chocolate cake recipe or chocolate with caramel sauce recipe. Damn!! I am so bad at naming this. Well, how would you call it?? 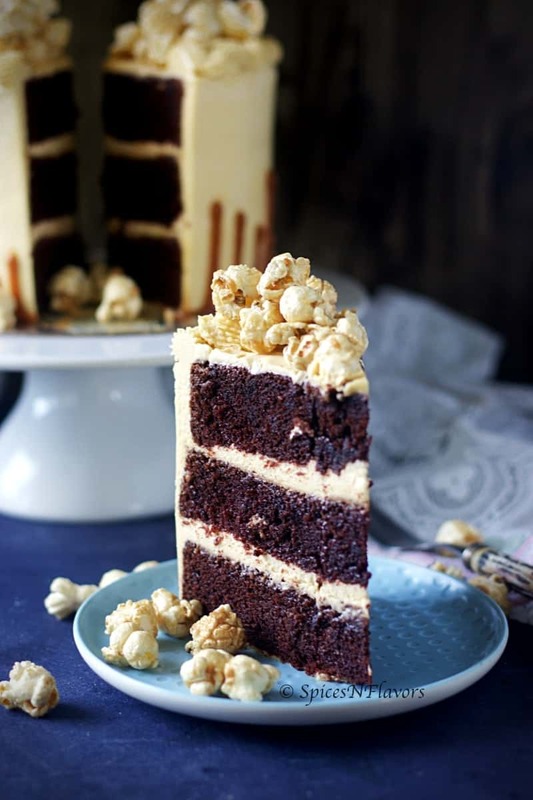 Basically, this chocolate caramel layer cake has 3 layers of chocolate cake with salted caramel frosting topped with easy caramel sauce served with caramel popcorn. How do you make Chocolate Caramel Cake? Today I have chosen to make an easy chocolate cake as my base and then made a Stabilized Caramel Whipped Cream Frosting which is nothing but adding homemade caramel sauce to whipping cream along with sugar. To further enhance the flavour of caramel, we will top the frosting with some more caramel sauce. If you would like to make a salted caramel cake as in just an easy caramel cake then I would suggest you use a plain vanilla cake recipe add some store-bought dulce de leche to it. And follow the caramel cake frosting recipe that I am just sharing in this post. But you have to trust me; this chocolate cake with caramel filling is to die for!!! This triple layer chocolate caramel cake makes a perfect birthday cake or even an anniversary cake. In short just perfect for any occasion. Can I make chocolate salted caramel cupcakes using the same recipe? Yes, definitely you can. Using this chocolate cupcakes recipe make some cupcakes. Once it is cool enough, use the caramel icing recipe that I have mentioned in this post to frost them. Drizzle some caramel sauce on top and you have some delicious chocolate and caramel cupcakes for you. Does caramel cake need to be refrigerated? Just like any other normal cake would, this Chocolate Caramel Cake also needs to be refrigerated in stages. Here are the steps of refrigeration that I follow while making cakes be it any flavour. 1. I allow the cakes to cool completely at room temperature itself since I make it a day before so it has ample time to cool. However, if you are running short of time you can refrigerate it until cool. 2. Level the layers. Apply frosting. Crumb coat. And after crumbing coating, I refrigerate it for a minimum of 30 mins. It is an absolutely essential step. Makes it easier to frost later. 3. Finally after the final coating and decoration again refrigerate it for 30 mins before slicing and enjoying :). Since its a salted ,caramel chocolate cake recipe – I have to mention about this amazing caramel sauce recipe. Talk about caramel dessert recipes we all are intimidated with the thought of making caramel sauce at home. And eventually we end up buying it from stores. Let me walk you through the exact steps of How to make caramel sauce at home without a candy thermometer? 1. We would heat the sugar and water until it turns amber golden in colour. 2. Stirring continuously add in the cream. And stir for another 1 minute to thicken the sauce. That’s it. Ain’t it that simple. Here is the step by step instructions with few tips on how to make caramel sauce without butter? 1. Make sure you have a deeper size saucepan. Add in sugar and water. Mix. Switch on the gas to med-low. 3. The sugar syrup would start boiling; the boils would subside to give you initially a light yellow colour and from here on pay close attention it’s just a matter of a few seconds. 4. Swirl the pan gently if needed. 5. You will observe that the colour is changing to darker yellow shade and to golden. If you are finding it difficult to determine when it is the exact golden shade then I have an alternative for you. Keep an aluminium foil side by your gas. Once you see the dark yellow colour you can add a drop of that sugar syrup on the aluminium foil in a time interval of 5-10 seconds and then you will have a clear picture of the colour. I used to do that initially when I was not confident of judging. You can check this video for an even clear idea. 6. Once you get the golden amber colour; take it off the flame and add the cream. Remeber to stir continuously. It would bubble up initially and once it subsides put it back on flame and stir for just 1 minute. 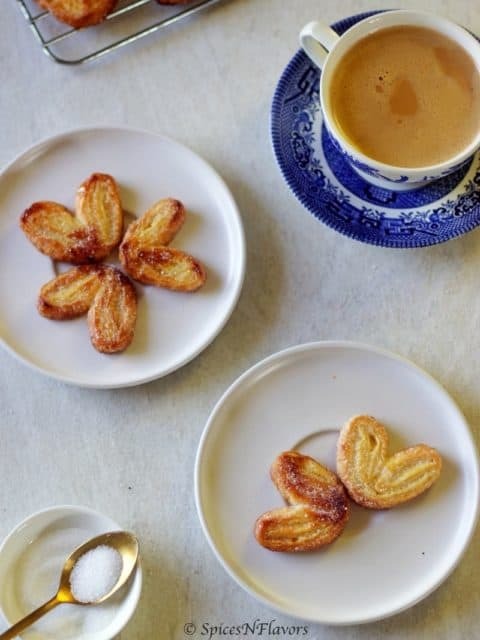 You have a perfectly made best caramel sauce ready for you <3 At this stage you can also add some salt and vanilla essence to make a salted caramel sauce. One more thing to note is that when you take it off the flame the sugar syrup is still cooking with the internal heat so the colour would darken and then when you add the cream it would darken even further on cooling. How do u make caramel frosting? 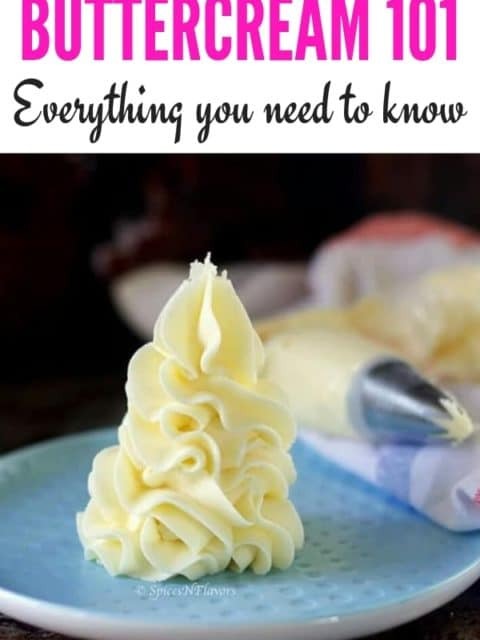 Now that your caramel sauce is ready you can simply add it to the medium of your icing like whipping cream, cream cheese, buttercream or even Italian meringue buttercream and flavour it up to get a caramel frosting. Today I am adding it to my Stabilized Whipped Cream Frosting recipe to make caramel cake filling. If you are looking for caramel sauce uses then the list is definitely endless.. You can use this as salted caramel topping on cakes like I have done today. The salted caramel sauce for ice-cream is one of my all time favourite combination. 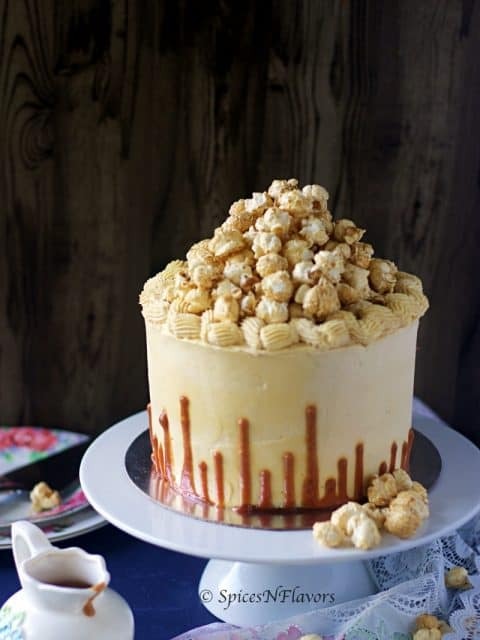 You can also use this caramel sauce for popcorn to make your own chocolate caramel popcorn cake. Yes, this definitely sounds intimidating, to begin with; but take the leap and try it just once this caramel sauce with white sugar recipe would be your go-to recipe for any salted caramel chocolate cake recipe you would ever try!! Coming to the flavours of this Chocolate Caramel Cake. For one to begin with the chocolate cake in itself is super moist and oh so chocolaty!! How do you make the perfect moist chocolate cake? You might know it from my earlier chocolate cupcakes post the key ingredient my friend is BUTTERMILK. Bamm!!! Yes, that is exactly what we have used today. Oh yes, check the recipe to know how is buttermilk made. It is easier than you think. And Cocoa powder, of course, is what makes it chocolaty. We have today used Stabilized Whipped Cream as the base for frosting. As this is the most sorted and favourite frosting for many of us. You can choose any icing that you prefer and add this best homemade caramel sauce to make a caramel frosting. 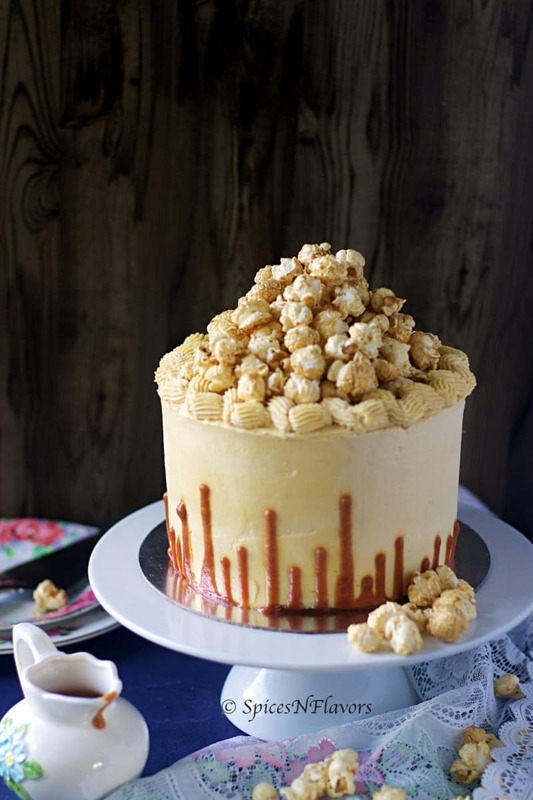 I choose to serve it with some salted caramel popcorns so I did not add any other textures in the cake but if you prefer you can add some caramel chocolate chips or maybe even praline in the layers to give it a crunch. To make it visually appealing I choose to make an Upside Down Drip Cake. You can decorate it as per your choice. Let’s now see How do you make caramel cake? 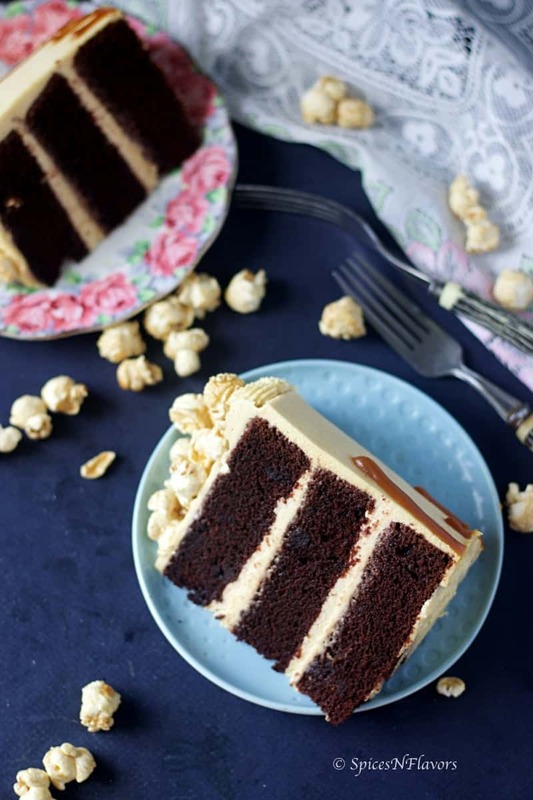 The ULTIMATE Chocolate Caramel Cake recipe - Layers of moist eggless chocolate cake with salted caramel stabilized whipped cream frosting and homemade caramel sauce topping served with popcorn; this cake made from scratch is better than anything that you could ever imagine. Add vinegar to your warm milk. Stir and Let it sit for 5 mins (and that's how simple it is to make your own buttermilk at home). Meanwhile, start sifting your dry ingredient. Sift all the dry ingredients (APF, Cocoa powder, BS and salt) into a bowl. Add in the sugar. Add all the wet ingredients one by one. Mix everything together to make a cake batter. Pour it into two separate 6-inch cake pans and bake in a preheated oven of 180°C for 35-40 mins. Take sugar and water into a deep saucepan and put it on a med-low flame. The sugar will melt and combine and the syrup would come to a rolling boil. The boil would subside and you would start seeing it turn into a pale yellow colour. In a matter of a few seconds, the colour would start darkening and when you see it turn to amber golden colour. Take it off the flame. Immediately pour the cream and stir together. The sauce would bubble up a lot but will eventually subside. Put it back into the flame and stir for just a minute. The sauce would darken and also start to thicken. Take it off the flame. Add salt and vanilla essence if using at this stage. Mix and transfer to a separate bowl and allow it to cool completely. Dissolve the sugar in the water. Set aside to cool completely. Whip the softened cream cheese until smooth. Whipping continuously pour in the whipping cream little by little until combined. Add in 60gms of prepared caramel sauce and icing sugar and whip the cream until stiff peaks stage. Once the cake layers are baked and cooled, trim the top off to get an even layer. Add the caramel whipped cream frosting on top. Spread it into an even layer. Next, top it with some caramel sauce and place the second cake layer. Repeat the cake layers. Crumb coat the cake with the same frosting and let it sit in the refrigerator for 30 mins. After 30 mins using the same frosting cover the entire cake to get a smooth even finish. It is not essential to frost the top layer as we would be flipping it eventually. After the final frosting let the cake chill for another 15 mins. Finally, start pouring the prepared caramel sauce along the edges of the cake (refer video for easy understanding). You do not have to pour the sauce on top of the cake. Again chill it for 15 mins or until the caramel sauce is completely set. 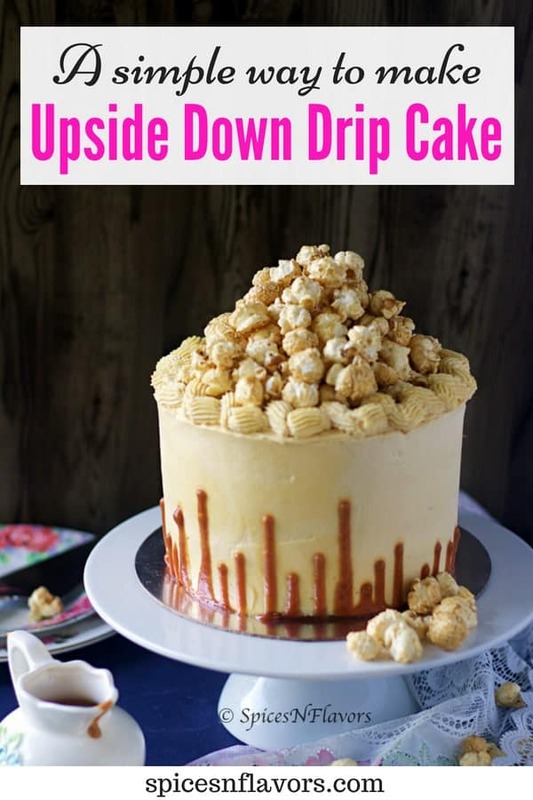 Once the sauce is set, place a cake board on top of your cake and just flip it upside down and slowly and gently remove the cake board layer from the top. Some tips and notes on this easy chocolate caramel layer cake. 1. While making the cake base, the milk has to be just warm and not hot. 2. The above recipe makes 2, “6-inch cake” layer base. To make the 3rd layer I halved the recipe and made it in a single pan as I have just 2 pans with me. 3. In your caramel sauce addition of salt and vanilla are optional. Adding salt would give you a salted caramel taste and this would then be an easy salted caramel cake recipe. I did not add these while making caramel sauce because I served the cake with salted caramel popcorn. However, the choice is yours while making your cake. 4. Similarly, the caramel frosting that you would prepare would be customisable too. 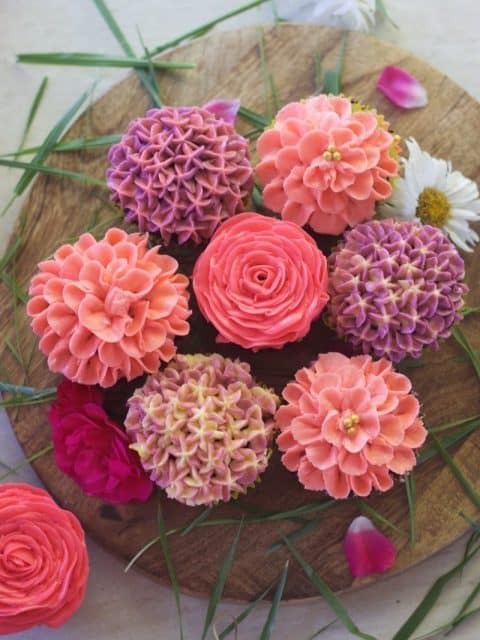 You can use any medium of frosting of your choice – Cream Cheese, Ganache, Buttercream or Italian Meringue Buttercream. And the amount of caramel sauce and sugar can be adjusted to taste. If you find that the frosting needs more caramel flavour go ahead and add some more caramel sauce to it. 5. There is a fine line between golden caramel colour and dark brown colour. If you heat the sugar syrup too long you would end up getting a bitter flavour to it. Also, guys, even I have noticed that these days I am writing everything in detail and trying to explain things in depth. Do you guys like to read all this information or do want me to cut it short? Do share your thoughts with me in the comment section below would love to know your opinion on the same.